Our air conditioning services in Cornelius, NC are complemented by excellent customer service. Air conditioning repair—If your air conditioner malfunctions, we’ll be there to help you fix it. We are dedicated to helping you maintain the comfort of your home throughout the year. 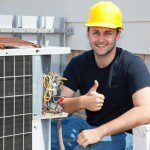 Air conditioner replacement—If we determine that the repairs your system needs are too extensive, we can help you with the air conditioner replacement process. We have air conditioner replacement options that fit every budget, and we also provide payment plans. Air conditioner installation—The way your air conditioner is installed plays a large role in how well your new system functions and how efficient it is. You can rest assured that we will install your new air conditioner quickly, efficiently, and properly. In addition to these air conditioning services, we can help you maintain the air conditioner that cools your home. Whether you need someone to simply tune-up your system or you’re worried that something’s wrong with it, we are always more than happy to come and take a look at your air conditioner. If you want to know more about our air conditioning services and what they entail, contact us at Cool Comfort Heating & Air. We look forward to meeting all of your air conditioner repair, replacement, and installation needs.